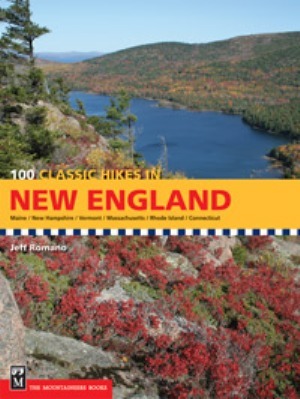 100 Classic Hikes in New England, by Jeffrey Romano, 2010. This is the Cadillac of New England hiking guidebooks, a handsome volume with well-written trail descriptions, color photos, and color topo maps. Many of the well-known White and Green Mountain hikes are here, but there is also full coverage of the many and varied hiking opportunities in southern New England. 256 pp, 6 3/4" x 9."